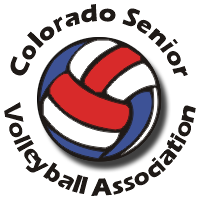 CSVA, the Colorado Senior Volleyball Association, is a 501(c)(3) tax-exempt organization devoted to providing volleyball playing opportunities for Colorado residents who are at least 50 years old by December 31 of the current year. CSVA has a yearly season consisting of two 10-week league sessions: Fall (September through November) and Winter (January through March). All league games are played during the day. Both sessions are followed by league tournaments. It supports players and teams participating in national and international volleyball competitions and sponsors player and referee clinics. Be sure to check Announcements for new and updated information. Standings -- Schedules -- Are You Playing?